My 8 year old son is very bright, but it took him a long time to discover a love of reading for fun, for years he read his books from school and the occasional fact book, but other than that he just wasn’t interested. We didn’t want to force him to read, I really believe that children need to find a book they love to inspire a love of reading generally. For Zak this was The Famous Five. We bought him an audiobook to listen to as he went to sleep and he then decided he’d like to read the actual books, which led to trying other books and now he can’t read enough, devouring Tom Gates, Diary of a Wimpy Kid and the David Walliams books faster than I can buy/borrow them for him. Luckily The Book People came to our rescue and sent us a box set of The Diary of a Wimpy Kid to review, which kept him going of a while. 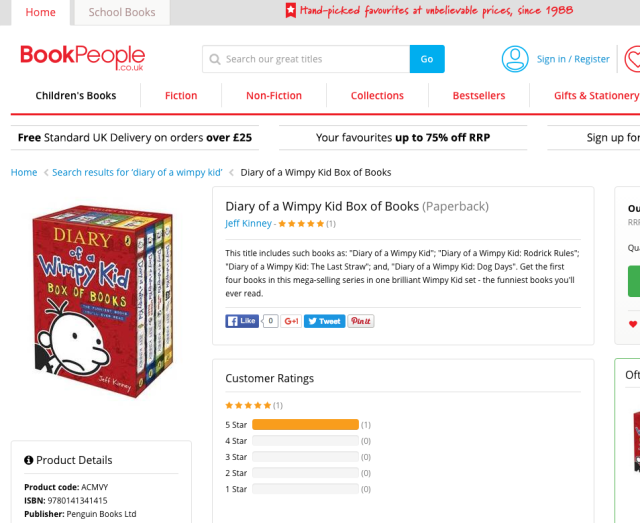 The Book People website is full of bargains, we bought the Roald Dahl box set recently, which has a whopping £76 saving from the RRP. I’m waiting for the Roald Dahl audiobook set to be back in stock too. I’d really recommend taking a look around the website for fantastic deals on kids and grown up books. Tom Gates, these are another series I credit with Zak learning to love to read. David Walliams, Zak’s favourite is Billionaire Boy. We’ve all giggled our way through the Jeremy Strong Collection. The Parent Agency by David Baddiel is another book that’s had Zak in hysterics. Finally and more for younger children, but Zak also enjoyed these Star Wars books. These animal science books are great fun to read and full of hilarious and disgusting facts. We’ve all a big grossed out and mesmerised by the latest Ripley’s Believe It or Not book. What are your favourite books for children? We were sent the box set shown above for the purpose of this post.